So I've finally got Carrara 8.5 now, and I'm wondering what I'll need to do to put together some Genesis characters that use my favorite V4 M4 characters shapes/faces/textures. Plus what I got in Carrara 8.5 already. Is there anything I'm missing? And what exactly would the process be? I'm thinking I'll need to build my V4 or M4 Genesis character in Studio and then somehow import it into Carrara? You need GenX to convert V4 or M4 characters, no way around it. It's not that hard, I'm sure the GenX thread has step-by-step instructions. GenX conversions are basically the same as any other Genesis morphs, you'll find them... somewhere, in their own category IIRC. I've never used them in Carrara, but they should show up. Any .dsf morph files that exist in the proper structure in the data folder will show up in the Parameters Pane in Carrara. I've never used GenX, but from what I understand it does place the morphs in the proper location, so it should work. Sweet. I have to get that GenX. I hope Dimmension 3D makes one for Genesis 2's too! If the new morphs have something specific in their title, like GenX_xxx, for example, they'd be easily filtered as shown in DAZ_jared's tutorial link above. I had already purchased V4 and M4 shapes for Genesis a long time back, in anticipation that someday Genesis would work for me in Carrara, and that with GenX I'd be able to keep the pretty V4 faces I've got while still playing with Genesis. It took about 45 minutes of searching through my orders before I finally dug up the old order and was able to download the V4 and M4 shapes. Then after several hours of frustration of trying to install it and find and apply it in Daz Studio, I finally figured out that as long as I had put the downloads in the correct folder (which I had) that there wasn't morphs to apply, but that they were automatically applied to any Genesis character and I could find the sliders for them in the Parameters tab (like I said, I *never* work with Daz Studio and I'm pretty much allergic to its interface, so I have no idea how to use it). If the new morphs have something specific in their title, like GenX_xxx, for example, they'd be easily filtered as shown in DAZ_jared's tutorial link above.He has already stated that he intends to create one for Genesis 2. Remember select the Actor Line to see the morphs, and the line above the actor line for Pose Controls. Quick update on my progress with this. I purchased both GenX and the Corrected V4 UV maps for Genesis. 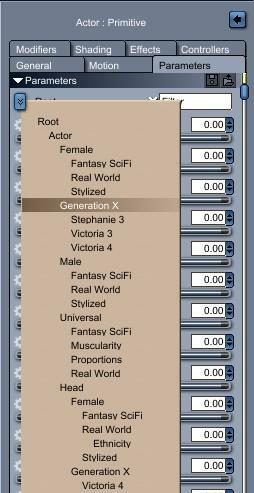 GenX is a big tool with lots of documentation and buttons/checkboxes/dropdowns, etc, and I haven't read through all the documentation and don't have a clue what most of it is for/does, but to export a V4 or M4 character morph I barely have to know anything to use it, also very easy and quick. I just build my character in Poser, save it to the character tab after importing all the morphs I want, and then open Studio and navigate through the runtimes to find the character figure I saved, and drag and drop it on the GenX tool. A press of the button and voila, I name the new character morph and the next time I load Genesis in Carrara, it's one of the morph sliders I can choose. It isn't an exact match, but it's close. I was bothered by this and figured out that the problem isn't in GenX, but the Daz V4 and M4 shapes set as they are actually close but different from the actual V4 and M4 shapes. It's a small enough difference that I feel that it is as absolutely close to getting the same face shape that I loved with any particular V4 character to work on Genesis. (but honestly, I prefer the actual V4 version than the Genesis copy). It's close enough to work though. So mostly I'm happy, and I can (mostly) report that this method works fine to get V4 character morphs to work on Genesis in Carrara.